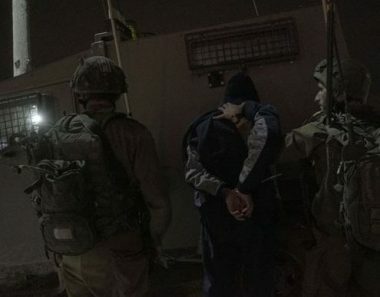 The Palestinian Prisoners’ Society (PPS) has reported that Israeli soldiers carried out, on Tuesday at dawn, military invasions and violent searches of homes, in several parts of the occupied West Bank, and abducted thirteen Palestinians. Dozens of soldiers invaded Nour Shams refugee camp, east of Tulkarem in northern West Bank, and abducted four former political prisoners’ Ala Ahmad Abu Qaseedo, 28, Nihad Yousef Abu Harb, 28, and Mahfouth Nathmi Aisha, 33. It is worth mentioning that Khalifa was imprisoned for twelve years, Abu Qaseedo for six years, Abu Harb for five years, and ‘Aisha for thirteen years. In Jenin, in northern West Bank, the soldiers searched a few homes and abducted Antar Abdul-Fattah Zeid. The soldiers also invaded homes, in Qalandia refugee camp, north of occupied Jerusalem, and abducted Ahmad Odah Yacoub, Mohammad Mteir, and Jasser Mohammad Abed-Rabbo. In Ramallah, in central West Bank, the soldiers abducted Fadi Hammad, from his home in Silwad town, north of the city, in addition to Majdi al-‘Arabid, 24. In addition, the soldiers abducted two young women, in the Jordan Valley in the West Bank, reportedly for wearing military uniforms and carrying the pistol. In related news, the soldiers installed electronic gates at the main entrances of Madama, Tal and Burin town, near Nablus, in northern West Bank. The soldiers also invaded homes in Teqoua’ town and ‘Aida refugee camp, in Bethlehem, and in Ethna town, near Hebron.